i just finished book 4 of Naomi Novik’s Temeraire series. ok. bottomline, i found it entertaining (hardly a surprise). 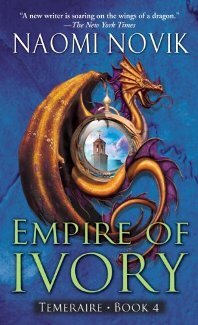 still, compared to the first 3 books (His Majesty’s Dragon, Throne of Jade, Black Powder War), i found Empire of Ivory rather flat and a bit less interesting. 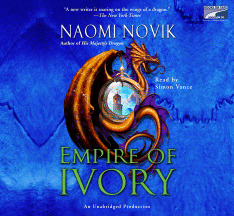 Empire of Ivory starts off a few days after the last scene in book 3 (The Black Powder War), with Temeraire and Capt. Laurence and their allies finally reaching the safety of British shores. 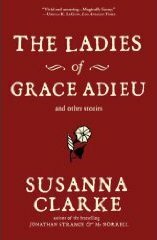 This fourth installment basically highlights Temeraire’s trip (along with his squadron mates Lily, Maximus, Dulcia, etc., and their crews) to Africa in their desperate search for a cure against the deadly malaise that was steadily decimating the draconian ranks of the British Aerial Corps. 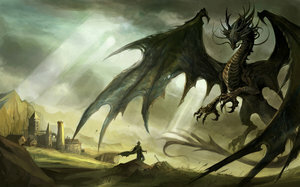 after finding the cure and surviving a run-in with the local dragons, which have their own peculiar hierarchy and mythology, the squadron heads back to England. Britain’s dragons are eventually saved. Meanwhile, the island’s aerial defenses have to make do with Arkady and the rest of his cohort (a bunch of wild Turkish dragons featured in book 3), along with a few surviving dragons — a measure that elicits mixed results. this series of events, however, prompts the British Admiralty to try to find a way to spread the deadly disease across the Channel — thereby ensuring that Napoleon’s dragons would suffer the same fate and consequently tilt the balance of power into Britain’s favor. finding this move vile and downright shameful, Capt. Laurence and Temeraire take matters into their own hands. Empire of Ivory ends with Temeraire and Capt. Laurence finally meeting Napoleon face to face and facing an uncertain fate as they consider the consequences of their actions. 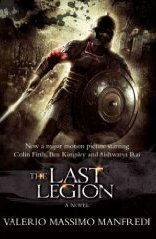 this hanging question, of course, sets the tone for book 5.
the publisher has already sent out advance notice that Book 5 will cover Napoleon’s invasion of England. hmmm… let’s hope book 5 doesn’t suffer the same lethargic pace that hounds Empire of Ivory. i really don’t want to give up on this series yet and i’m still wondering how ms. novik will integrate the Duke of Wellington into the series. perhaps in book 6…? finally! Acalypto is scheduled to appear in local theaters a week from now (*thunderclap*, followed by sound of *clashing cymbals*). here’s hoping nothing will come up to delay this playdate (again). not that i expect to enjoy all of it (it’s a gory bloodfest, to say the least). i’ll probably be blinking through patches, but i sure am not gonna let that get in the way of enjoying this flick. truth is, i’ve been trying to convince a few adventurous souls here to watch the movie with me. as of last count — it’s still zero nyahahaha! scaredy cats! which reminds me, the Temeraire series (3 books so far) is definitely going to be screenplayed by good ol’ Peter Jackson (LOTR, Heavenly Creatures). yayyy! i must admit this is one of the biggest reasons why i began searching for this series in local bookstores. 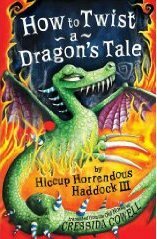 as soon as i’ve read some excerpts of book 1 (His Majesty’s Dragon), i fell for it hook, line and sinker. i haven’t have had much time to read lately, so i’m back to skimming through some of my old favorite titles. these include a number of fantasy books: Naomi Novik’s Temeraire series (His Majesty’s Dragon, Throne of Jade, The Black Powder War) and Susanna Clarke’s challenging but hugely satisfying Jonathan Strange and Mr. Norrell. There is also John Keegan’s masterful Mask of Command and Capt. John Kincaid‘s droll autobiographical account of the Peninsular War — Adventures in the Rifle Brigade and Random Shots from a Rifleman. i’m not sure why, but for some reason i find Napoleonic wars fascinating, particularly the Peninsular War (1808 – 1814) which took place in the Iberian Peninsula. i even plodded through vols. III and IV of Sir Charles Oman’s A History of the Peninsular War (for cryin’ out loud! ), which a lot of my friends find baffling if not downright bizarre. in fact, i have yet to meet anyone (locally at least) who shares this interest. i guess that makes me a bit of an oddball. big deal.